Def Leppard singer Joe Elliott has offered his take on Brian Johnson’s departure from AC/DC in 2016 due to medical issues. Following 2014’s “Rock Or Bust” album, AC/DC halted the accompanying tour in early 2016 after Johnson was advised by doctors to stop performing in arenas and stadium-sized venues immediately or risk total hearing loss; Axl Rose stepped in to assist the band complete a spring run across Europe and a ten-show fall US trek. While Elliott didn’t see any of the Rose-fronted AC/DC shows in person, "I saw some stuff on YouTube, and I think he did a pretty good job, actually. He’s a huge fan, so he took to that like I would take to singing a Mott The Hoople song." "Obviously, there's detractors in any walk of life, so somebody out there thinks he was awful, some people think it was the best thing ever," he added. "So it is what it is, but it kept AC/DC on the road, I suppose. But it's not really AC/DC anymore, is it?,” referring to the band’s lineup changes in recent years. “It's basically just Angus and the other four now. So I don't know that Brian's ever gonna come back." 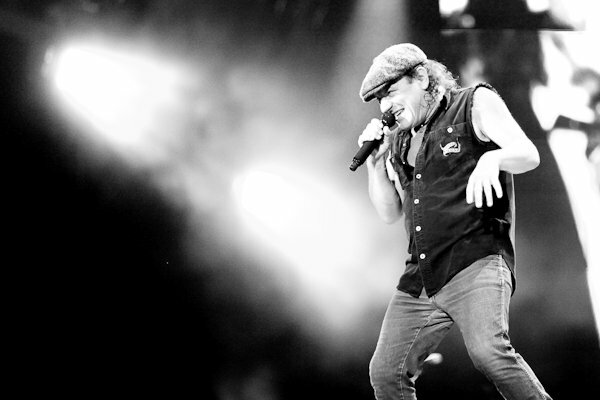 While rumors of Rose’s continued involvement with AC/DC surfaced in 2017, the band’s future remains unknown. The AC/DC family recently suffered the loss of legendary musician and producer George Young at the age of 70 in October and the passing of Malcolm Young at 64 in November following a long battle with dementia.